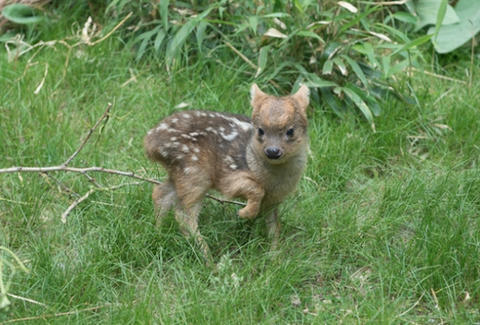 In what is the cutest thing to happen to NYC since getting a cat cafe, the WCS Queens Zoo has announced the birth of a baby pudu deer -- the world's smallest deer species. The precious lil' male fawn was born May 12th, the third to arrive at the zoo in the last three years, according to zoo representatives. Unlike the typical deer darting across dark roads and occasionally ending up on walls, this species measures only about a foot tall at the shoulder. Basically a deer, but the size of a Chihuahua -- and in this case, a baby one of those things. The baby only measures about 6in tall. Just one look at that little furball and you'll be sure to break from your daily resting doe face. The pudu are typically shy and like to hide in vegetation. When they sense danger, they bark and even run in a zig-zag pattern to evade predators like cats, owls, foxes, and pumas, according to the zoo. Pudu are native to Argentina and Chile, and because of habitat loss and other factors, they've been designated as "vulnerable" by the International Union for Conservation of Nature (IUCN). Luckily, it seems like the fawn will do just fine as a New Yorker -- unless it tries to take a rush hour subway. And in that case, it doesn't stand a chance. Tony Merevick is Cities News Editor at Thrillist. Send news tips to news@thrillist.com, and follow him on Twitter @tonymerevick.